Another race, another Webber crash and another flurry of defences for the man. Let's be honest, co-incidences like this don't happen. I was taken aback when I heard Messrs Coulthard & Brundle say Kovalainin's Lotus should've given way to the faster car. It's a race! When Lotus joined the grid this time last year everybody (and I mean everybody!) was waxing lyrical about the prospect of a classic name being reunited on the grid with Ferrari et al. Yet when Lotus are racing (note the word "race" there because Kovalainin had position) they are criticised for not moving to one side to let a faster car perform it's victory parade. Lets look at what happened with this particular incident. Webber is making up for lost time having pitted unexpectedly. He advances upon the Lotus. The Lotus holds it's line. The Lotus moves toward the outside for the braking area in order to, you've guessed it, brake. And then all hell breaks loose. Why? According to Webber; "I was going a lot faster than Heikki and then a long, long way before the braking point he braked, about 80 metres before". 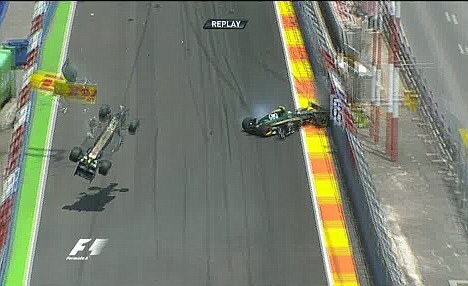 Fair enough perhaps Heikki braked earlier than usual. However; this was an unusual lap because they were racing one another for the corner! Webber should know that. For comparison look at how Button dispatched the Toyota of Kamui Kobayashi in Brazil last year for the title. Button patiently stalked the talented rookie and then performed a serene manoeuvre worthy of a World Champion (literally) to take command. Note the lack of arrogance, impatience & aggression so often associated with Webber. As for how such instances should be viewed in future, I agree with Lotus chief Mike Gascoyne: “He was defending his line and racing for position, and that’s what we will always do in that situation”.